Shackelford Heating & Cooling is proud to carry and install top-of-the line Carrier® products for our customers. Over the years, Carrier’s advancements in energy efficiency have helped protect the environment while ensuring effective heating and cooling equipment. These products are world-class. 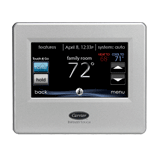 Carrier’s home comfort solutions can ensure consistent temperature, air quality and humidity throughout the home. These systems are also quiet, energy-efficient and reliable. As a Carrier Factory Authorized Dealer, we know how to repair and service the products we offer and ensure that they last a long time. 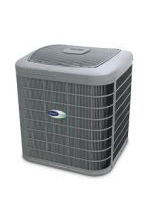 Carrier air conditioners have high SEER numbers. SEER stands for Seasonal Energy Efficiency Rating and the higher the SEER number, the more efficient the air conditioner is. 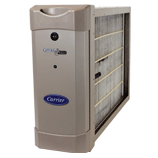 We offer a line of Carrier products that start from 13 SEER and go all the way up to 20 SEER. Furnaces don’t just produce warmth during winter. They also play a vital role in providing constant air circulation all year round. Our furnaces have high Annual Fuel Utilization Efficiency values. This means they can provide you with a lot of heat per fuel unit. Heat pumps look and function just the same as air conditioners when you use them to cool your interior. Of course, you can also use heat pumps to provide warmth for your home. 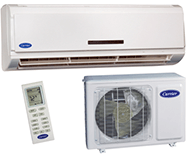 We offer different heat pump configurations to meet your specific comfort needs. It takes more than a high-quality HVAC system for maximum home comfort. You may want to consider indoor air quality products too. Our ventilators, humidifiers, air purifiers and UV lamps can help create a healthier, fresher environment for your family. Our HYBRID HEAT dual fuel systems provide an economical solution to homeowners worrying about utility costs. They deliver exceptional performance by automatically choosing the most economical heating source during moderate heating conditions. Thermostats can help you control every part of your indoor comfort, from humidity to temperature. You can even set preferences for different rooms in your home. Some thermostats also have energy management and remote access features. 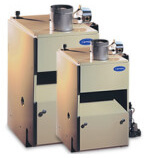 We have quiet, durable and energy-efficient boiler systems for any kind of home. Many of the models we offer are ENERGY STAR®-qualified because they have AFUE ratings that range as high as 90 percent. Our ductless systems allow you to have air conditioning in a room without ductwork. They are also an effective solution for a room that is consistently a little too hot or too cold. We carry a variety of filter models. 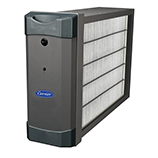 It’s important to change filters regularly to maintain HVAC efficiency throughout the year. Shackelford Heating & Cooling is confident that we have the right product for your heating or cooling needs. During our initial consultation, we will gladly discuss the unique features and benefits of our products in-depth. Call us at (608) 835-7755 to learn more about our products or to schedule an appointment.